Weather at Lexington-Blue Grass Airport (LEX) was fine on the morning of August 27 with a small shower approaching from the West. It was still dark just after 06:00 as Comair flight 5191 taxied out for takeoff. The flight was cleared for a runway 22 departure, which is Lexington's main runway. Because the runway was repaved just recently with an added safety area at the approach end of runway 22, one taxiway was no longer in use. Since August 20 the taxi route to runway 22 was changed. The crew inadvertently lined up on the shorter (3500 x 75 feet) and unlit runway 26. The first officer commenced the takeoff roll. One of the pilots made a remark about the lack of runway light illumination, but the takeoff was continued. The fully laden CRJ was not able to rotate within the 3500 feet runway distance and continued past the runway end. It knocked down a metal fence and continued onto a field. The airplane struck several trees and burst into flames on a working farm. NASA ASRS records show a possible similar scenario when some 13 years earlier a twin engine passenger jet inadvertently taxied into position on runway 26 at LEX while being cleared for an immediate runway 22 takeoff. The tower controller noticed this and cancelled the takeoff clearance. According to the report "Possible contributing factors were poor visibility and wx (rain), confusing rwy intxn and twr's request for an immediate tkof." In the meantime work had been performed on the runways at LEX. Since October 2003 for instance a runway resurfacing project was started. The project also added 600 feet of safety area at each runway end. PROBABLE CAUSE: "The flight crew's failure to use available cues and aids to identify the airplane's location on the airport surface during taxi and their failure to cross check and verify that the airplane was on the correct runway before takeoff. Contributing to this accident were the flight crew's nonpertinent conversation during taxi, which resulted in loss of positional awareness and the Federal Aviation Administration's failure to require that all runway crossings be authorized only by specific air traffic control clearances." Require that all 14 Code of Federal Regulations Part 121 operators establish procedures requiring all crewmembers on the flight deck to positively confirm and cross-check the airplane’s location at the assigned departure runway before crossing the hold short line for takeoff. Require that all 14 Code of Federal Regulations Part 121 operators provide specific guidance to pilots on the runway lighting requirements for takeoff operations at night. Work with the National Air Traffic Controllers Association to reduce the potential for controller fatigue by revising controller work-scheduling policies and practices to provide rest periods that are long enough for controllers to obtain sufficient restorative sleep and by modifying shift rotations to minimize disrupted sleep patterns, accumulation of sleep debt, and decreased cognitive performance. Develop a fatigue awareness and countermeasures training program for controllers and for personnel who are involved in the scheduling of controllers for operational duty that will address the incidence of fatigue in the controller workforce, causes of fatigue, effects of fatigue on controller performance and safety, and the importance of using personal strategies to minimize fatigue. This training should be provided in a format that promotes retention, and recurrent training should be provided at regular intervals. 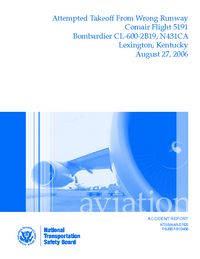 Work with the Federal Aviation Administration to reduce the potential for controller fatigue by revising controller work-scheduling policies and practices to provide rest periods that are long enough for controllers to obtain sufficient restorative sleep and by modifying shift rotations to minimize disrupted sleep patterns, accumulation of sleep debt, and decreased cognitive performance. Require all air traffic controllers to complete instructor-led initial and recurrent training in resource management skills that will improve controller judgment, vigilance, and safety awareness. Distance from Lexington-Blue Grass Airport, KY to Atlanta Hartsfield-Jackson International Airport, GA as the crow flies is 486 km (304 miles).